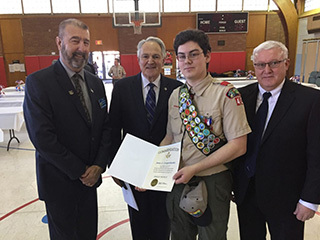 Boy Scout James A. Cowperthwaite, Troop 42, was made an Eagle Scout at his Court of Honor, January 15, 2017. At the ceremony he was also the recipient of the Masonic Eagle Scout Award, which was presented by R:W:. Arthur H. Pritchard Jr. District Deputy Grand Master, representing Most Worshipful Jeffrey M. Williamson, Grand Master of Masons in the State of New York. As the award was presented to James in Red Hook, New York, the ceremony was also attended by Brothers James Fluegel, Secretary, and Chester Damon, Senior Warden of Hendrick Hudson Lodge, #875. Through Brother Fluegel’s efforts, the Lodge maintains a cordial relationship with Scout Troop 42.